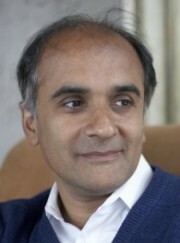 Pico Iyer travels the world. His travel books include reflections on such exotic places as Kathmandu and Asunción. His novels have been translated into Turkish, Russian, and Indonesian. Yet, he’s not what you might expect. He’s never owned a cell phone, never Tweeted nor entered Facebook. He lives in a rural community and regularly retreats to a religious hermitage—a place of quiet solitude away from both family and work. Pico Iyer’s life alternates between two radically different worlds—the airport and the monastery. Most of us don’t live such a polar existence. But his reflections in “The Joy of Quiet,” a recent New York Times article, can help us all gain perspective on living a healthy life in our hectic world of technological busyness. In “The Joy of Quiet,” Iyer describes some of the cultural contradictions of our technological age. We have more and more ways to communicate, as Thoreau noted, but less and less to say. Partly because we’re so busy communicating. And — as he might also have said — we’re rushing to meet so many deadlines that we hardly register that what we need most are lifelines. The central paradox of the machines that have made our lives so much brighter, quicker, longer and healthier is that they cannot teach us how to make the best use of them; the information revolution came without an instruction manual. All the data in the world cannot teach us how to sift through data; images don’t show us how to process images. The only way to do justice to our onscreen lives is by summoning exactly the emotional and moral clarity that can’t be found on any screen. Two journalist friends of mine observe an “Internet sabbath” every week, turning off their online connections from Friday night to Monday morning, so as to try to revive those ancient customs known as family meals and conversation. Finding myself at breakfast with a group of lawyers in Oxford four months ago, I noticed that all their talk was of sailing — or riding or bridge: anything that would allow them to get out of radio contact for a few hours. In my own case, I turn to eccentric and often extreme measures to try to keep my sanity and ensure that I have time to do nothing at all (which is the only time when I can see what I should be doing the rest of the time). I’ve yet to use a cellphone and I’ve never Tweeted or entered Facebook. I try not to go online till my day’s writing is finished, and I moved from Manhattan to rural Japan in part so I could more easily survive for long stretches entirely on foot, and every trip to the movies would be an event. For more than 20 years, therefore, I’ve been going several times a year — often for no longer than three days — to a Benedictine hermitage…. I don’t attend services when I’m there, and I’ve never meditated, there or anywhere; I just take walks and read and lose myself in the stillness, recalling that it’s only by stepping briefly away from my wife and bosses and friends that I’ll have anything useful to bring to them. In “The Joy of Quiet,” Pico Iyer gives us some important help in understanding the subtle and powerful impact of technology on our lives. He gets us beyond the questions of content—is it good or bad, moral or immoral, wholesome or vulgar? In the 24/7 world of endless internet connections and infinite mounds of information, he directs us to the essential question, “What is essential?” The answer to this question must come from beyond the technological arena (my observation, not his) since “the information revolution came without an instruction manual”. Can the Church recover a meaningful understanding of Sabbath for our digital age? Can Christians learn to wisely determine what is essential in a world of “always connected?” I’m not thinking about legalistic guidelines or some sort of blue laws. I am concerned about a proper understanding of what it means to “cease from our labors” which in our age is much the same as “cease from our distractions.” The Church desperately needs a theology of Sabbath. And I would add that we cannot have a meaningful understanding of technology that is not centered on a proper theology of rest. I’m a little like Iyer. I don’t tweet and only recently got on Facebook, and then ONLY to communicate with a few college students about important issues like you raise. As Christians we seem to have no clue about sabbath rest.